In the past few years, the market has dramatically changed and the home foreclosures have reduced. But with the fall in a number of foreclosures, the requirements of the market have increased. More than ever before, the demand for home appraisal has become crucial for all home owners. Therefore, when a buyer plans to purchase a house, he should make sure that the type of property he wants to purchase is proportional to the type of loan he has applied for. This is because almost every mortgage has a requirement for property appraisal before the loan is given to the buyer. However, there are certain exceptions where loan product doesn’t require the appraisal. When you look into the type of property appraisals conducted in the market, you will see that they are of two types, FHA appraisal and Conventional Appraisal. Once you apply for an FHA loan, one of the loan requirements is that the home appraisal is done at a higher standard as compared to the conventional appraisal. The FHA loan has a minimum down payment requirement but conventional loan has a higher down payment requirement despite its lower standards. The conventional appraisal is based on the actual home value, which can be calculated by either the income method, the comparable sales method, or the cost method. The comparable sales method is the most commonly used method of all three methods. It allows the appraiser to calculate the value of property being appraised by taking the most recent sales, having almost the same characteristics, and that are closely related to the subject property. On the other hand, the FHA appraisal not only considers all the above mentioned details, but also confirms whether the house under appraisal meets the minimum standard of living requirement set by the department of Housing and Urban Development (HUD). The property cannot have any holes in the ceilings or walls, broken windows, and broken stairs. If there are more than 3 broken steps in a staircase, a handrail should be there. There should also be an appliance at a spot if there is a built in place for it. Moreover, a heating and cooling system, and electrical safety system in working condition should also be present in the house. In short, the property should be in a good condition and must not be badly repaired. The loan terms of both the appraisals also differ from each other. A minimum credit score is required to apply for an FHA loan. Also, a down payment of only 3.5 percent is needed with this loan and it allows the sellers to pay up to 6 percent of the property price for the closing cost of the buyers. With FHA loans, a buyer can easily afford a property as it reduces the overall monthly payments by allowing higher debt to income ratio and by giving them an opportunity to pay lower mortgage insurance premiums. You can also utilize the gift funds that are given to you by your loved ones. But with a conventional loan, you will be required to pay a minimum of 5 percent down payment. The mortgage insurance premium is comparatively higher in conventional loan and the seller is allowed to pay 3 percent of the purchase price in buyer’s closing cost. Unlike a conventional appraisal, FHA appraisal insures a mortgage by providing backing on behalf of eligible and approved borrowers. This is the reason why it is also known as the FHA-insured mortgages. The reason behind this is to ensure that lenders want to make sure that the property purchased using these insured mortgages is well maintained, and secure. Conventional appraisal doesn’t take into account the fact whether the property purchased is safe and secure or not. Therefore, whatever appraisal method you choose, it is important that you should always consider the type of property you are interested in and it should match with the type of loan you will apply for. Hira Waqar. 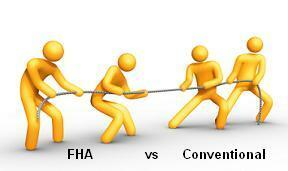 "Difference between FHA and Conventional Appraisal." DifferenceBetween.net. August 25, 2015 < http://www.differencebetween.net/business/difference-between-fha-and-conventional-appraisal/ >.